We love stained glass, and wanted our own sorta stained glass, with pictures of nice things, bright colours and light. This is how our Stained Glass Style Custom Artwork plugs came about. These are fully-filled and do come up a bit heavier than our usual custom artwork plugs (incidentally, these are also fully filled, but we lighten the load on them. There's a plug weight/mass chart here). 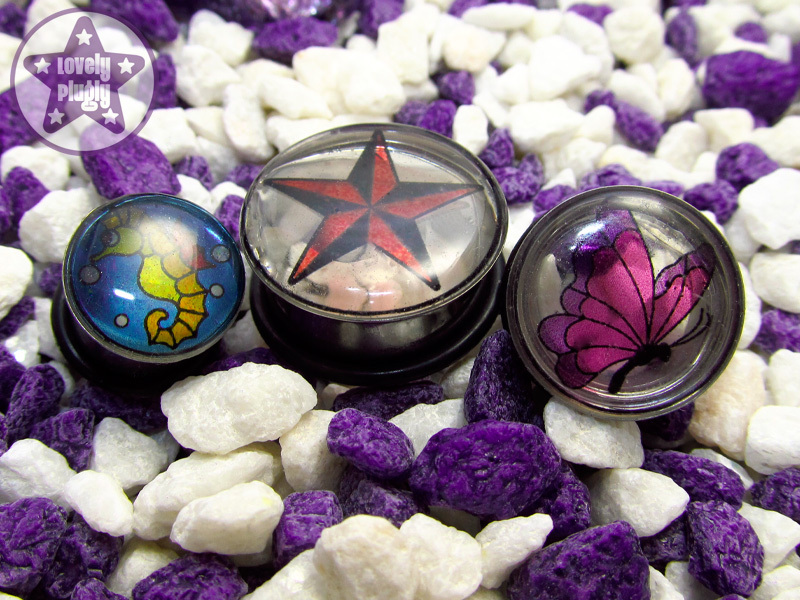 Stained Glass Style Custom Artwork plugs are available from this listing in sizes 10mm / 00g up to 30mm / 1-3/16". We could also do 8mm / 0g but this would depend on the artwork, so you're probably better off making a custom request on the product page if you fancy some in this size.